A couple of weeks ago, I was lucky enough to meet Luisa Weiss, the author of one of my favorite food blogs - The Wednesday Chef. She has written a memoir that recently came out, and her book tour brought her to Boston. One of the first recipes that I ever posted here was from Luisa's blog, and I was super excited to meet her. While I was at the reading, I realized that I hadn't cooked one of her recipes in a while, and I thought to myself that it would be fun to post about one of recipes from her book. So I kept that in mind as I was reading the book and made mental notes about the recipes I wanted to try. In the bowl of a food processor, pulse flour, sugar, and salt to mix. Add butter and pulse until mixture looks like coarse meal, with some pea-sized chunks of butter. Drizzle in 3 1/2 tbs water and pulse until dough just holds together when squeezed (you may need to add one more tbs of water to get the dough to hold together). Transfer dough to a work surface and knead 3-4 times (no more) to bring dough together. Pat dough into a ball and shape into a 4-inch disk. Wrap in plastic and refrigerate for at least 30 minutes. After dough has chilled, transfer it to a lightly floured work surface. Use a lightly floured rolling pin to roll the dough into a 14-inch circle. Be sure to lift the dough and sprinkle the work surface with more flour from time to time to keep the dough from sticking. Trim any ragged edges and transfer dough to a parchment-lined baking sheet. Preheat oven to 400 deg F. Arrange apples in a ring 2 inches from the edge of the dough, overlapping apple slices as you go. Continue until you cover the dough surface (except the outer 2 inches). If you have more apples, add a second layer. 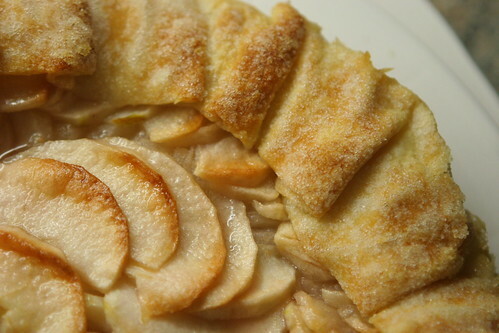 Fold the dough edge in to cover the apples, pleating the dough as you work around the tart. Brush melted butter all over the apples and crust, and sprinkle apples and crust with 3 tbs sugar. 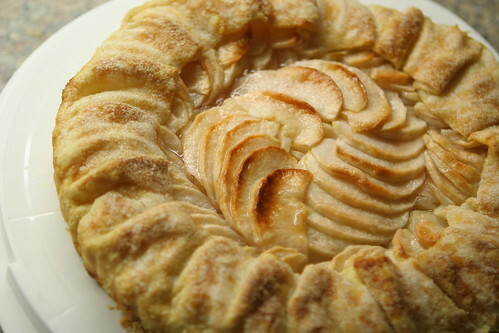 Bake tart in the center of the oven until the apples are soft and brown in spots, and the tart is golden brown. Rotate tart every 15 minutes for even browning. While tart bakes, put reserved apple peels and cores in a small saucepan with 1/2 cup sugar. Add just enough water to cover and simmer the mixture for 30 minutes. Strain syrup and return to saucepan. Simmer until syrup has reduced and thickened. When tart is done baking, transfer it to a cooling rack. Cool for at least 15 minutes, then brush glaze over apples and serve. (Note: you will probably have extra glaze, which can be reserved for another use). Tart is best on the day it is made, but leftovers can be heated in a 350 deg F oven to re-crisp the crust. The presentation is lovely, so I can see why you won that category! It looks very tasty as well.